Jack offers a FREE first / introductory lesson! My name is Jack and I'm a professional freelance musician offering private drum tuition from my personal practice space, resided at Stayfree Music, Leicester. I am a graduate of The Academy of Contemporary Music with a First Class BMus (Hons) Degree in Professional Music Performance. Aside education, live performance is a big part of my career and passion, performing across the U.K and most recently around the world on board P&O cruise ships. For the past 3 years I have continued to teach private one to one lessons from my resided space at Stayfree Music, catering for all ages, abilities and ambitions. In addition to this I have also provided group percussion workshops onboard P&O cruise ships during my various contracts with the company. I have an up to date enhanced DBS check. My initial approach to teaching is simple… to have fun! I provide tutoring for the casual beginner, up to the aspiring professional, covering the vast majority of musical styles. You as student will have a personal curriculum based on your current level and aspirations. Lessons take place on a professional drum kit and are accompanied with hand out sheets, backing tracks and endless educational material I have collected over the years. The Rockschool syllabus is followed if you wish to take graded qualifications on the drum set. 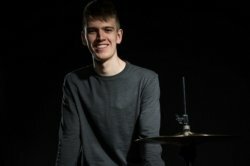 To see if I am the right tutor for you, please get in touch and lets organise your first (FREE) drum lesson! Thanks, I hope to see you soon!